A terrestrial or land turtle, so named because it can withdraw its head and legs completely into its carapace—upper shell—and its plastron—lower shell. Relatively small, ranging from 4-1/2” to 6-1/2” in length, adults have a high-domed, oval shaped carapace. Sometimes the Blanding’s turtle is confused with the box turtle, but it does not have the ability to completely withdraw into its shell. 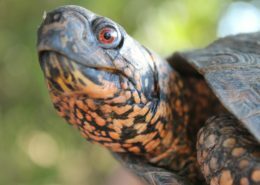 Coloration in adults: carapace is brown or black with yellow, orange or reddish with an irregular blotch pattern. The plastron is generally lighter in color with dark blotches, or sometimes completely tan, brown or black. The head and neck are a light and dark combination, including black, brown, orange or yellow. 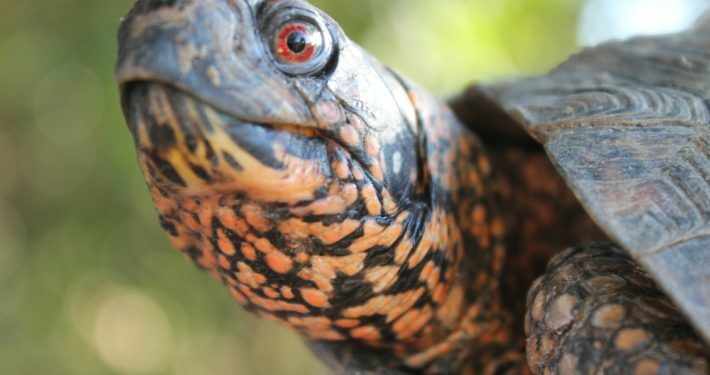 Very versatile— can be found in both dry and moist woodlands, brush fields, thickets, bogs, swales, fens, marsh edges stream banks and well-drained bottomland—if adequate food and water, box turtles will populate these areas. Their range is from southeastern Maine to northern Florida, and west to Michigan, Illinois and Tennessee. Within Massachusetts the greatest density is the southeastern regions of the state. 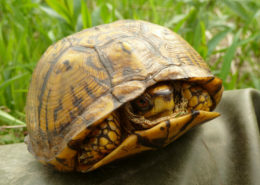 In the northern part of its range, box turtles will hibernate from October/November to mid-March or April, overwintering a few inches below the soil and under leaf cover or woody debris. As the temperature drops they will burrow further into loose soil. They do not hibernate communally but may be in close proximity to one another. With the advent of warmer weather they will emerge to forage and mate in the forest and fields. During summer months most activity is in the morning and evening, particularly after a rainfall. To avoid the heat of the day they will seek shelter in cool areas such as rotted logs, mammal burrows or mud. They may scoop out a domelike space, called a “form” to sleep in at night, in leaf litter, grasses, mosses or ferns. They may return to these same forms over a period of weeks. In extremely hot weather they may be found entering small, shallow pools and puddles to maintain regulate their body temperature. Box turtles are omnivorous. They will eat slugs, insects, earthworms, snails and even carrion. They have a fondness for mushrooms, berries, roots, leaves, seeds and fruits. Their nose is just above their mouth. It has two openings called nares (comparable to our nostrils). They have an excellent sense of smell, which they use to help them find food, mates, and territory. They don’t have teeth. Instead, they have a rigid beak with upper and lower jaws covered by sharp, horny ridges they can use to chew the tough, fibrous vegetation they eat. Eastern box turtles are a “species of concern” due to the decimation of their habitat areas, road mortality and other mitigating causes—generally related to human interference. 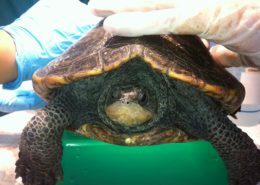 Salmonella - can be transmitted easily to humans by humans touching a surface previously touched by the turtle. Turtles can carry the infection asymptomatically, meaning they do not show signs of illness. 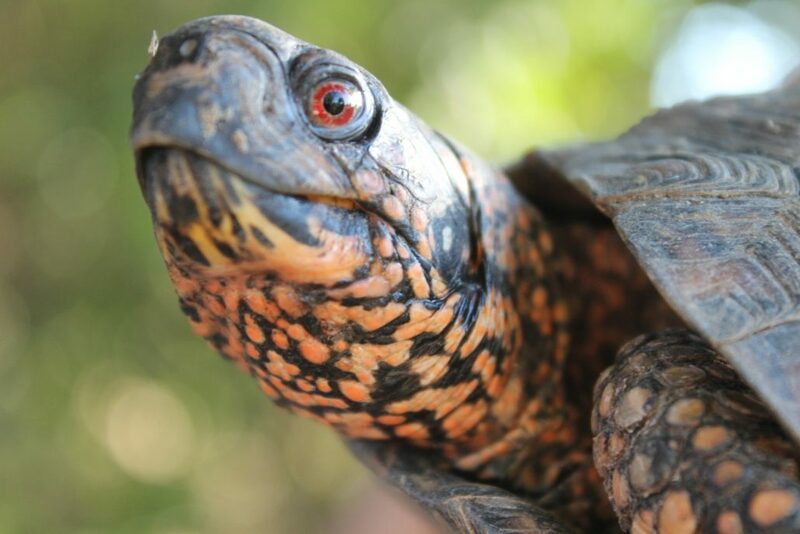 Box turtles are commonly kept as pets and the prevalence of salmonella is not uncommon. Found a turtle in yard There’s nothing you need to do for it. It might live in your yard, or maybe it’s just passing through. Either way, just leave it alone to carry on with its daily activities. Don’t try to keep it as a pet — it’s a wild animal and entitled to be free, unless it’s injured. If injured, contact an expert for advice. When helping a turtle cross the road carry it to the side it is heading towards— it was headed that way for a reason.. You should never pick up a turtle by the tail — it can hurt it. Pick it up by grabbing on each side of its shell behind the front legs. It might tuck itself into its shell and or it might kick at you. Hold it tight and carry it close to the ground to prevent injury in case it falls loose. Turtles should never be turned around. If you do, they’ll just eventually turn back around and try to cross the road again. 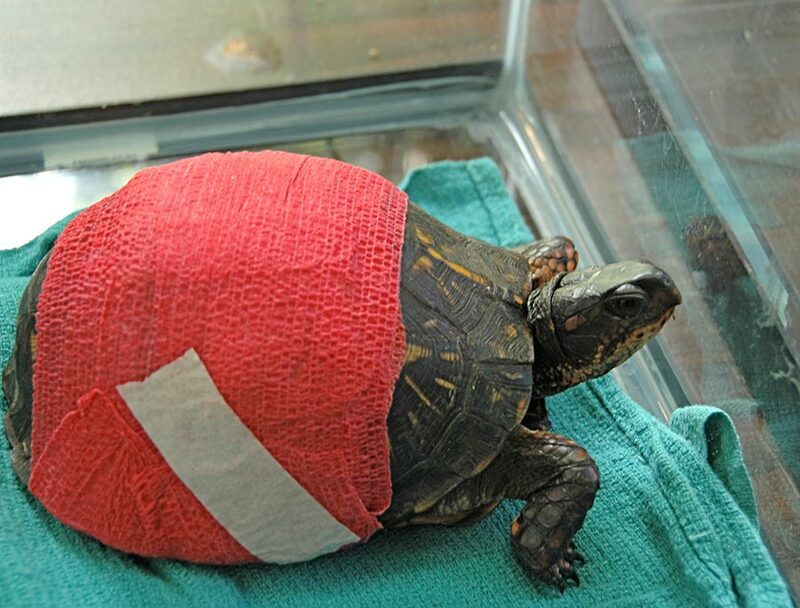 An injured turtle should be taken to a wildlife treatment center.